How do frugal people become frugal in the first place? I’ve often wondered how it happened to me. Did I learn it at home? Maybe a bit. I grew up in a solidly middle-class home and remember learning to look at sale racks and do price comparisons. Actually, I do think it became ingrained in me pretty early to look for less expensive or “good enough” options. But with two working parents, we certainly had our share of convenience items at home as well. That’s just it. With busy families sometimes convenience wins out because time is valuable as well. This is why when it comes to frugality, I like the easy wins. It’s the things that essentially take the same amount of effort as before. If you are totally new to being frugal, then start out by dipping your toes into the frugal pond. Look through the list and find 2-3 things that seem doable to you and your family and work from there. You’ll probably find that these tips on how to save money are pretty easy to follow. You can save water by simply waiting for full loads of dishes or clothes to be washed. My favorite way to save money on water is, if you live in an older home, to make sure you are using low-flow plumbing in the bathroom. Showerheads and faucet aerators are inexpensive and easy to install and help you save money on those rising water bills. If you are still using a stash of CFL bulbs, try to gradually replace them with LED bulbs. Not only do you not have to worry about disposing of hazardous waste (CFL bulbs contain mercury), but we’ve found LEDs last a long time and are much more energy efficient. It’s actually pretty rare for us to have a bulb go out as about 80% of our lights are now LED. There are even ways to save on the heating bill. If you don’t already have a programmable thermostat, it’s a good investment. You can have it automatically lower the temperature at night and when you are out of the house during the winter and the reverse during the summer, saving a bit of energy. Of course, dressing for the weather also helps keep the thermostat where it should be. If someone in the family likes wearing shorts even when it’s freezing outside then there are some adjustments that can be made to the wardrobe selection. Outside of housing, food is often a family’s largest expense which is why it’s a good place to focus on cutting expenses when possible. A good place to start before you even head out the door is to make a plan. First, figure out which produce is in season and check sales at your store. Food that is in season will be less expensive and also gives you a bit of variety throughout the year. Armed with that information you can create a meal plan for the week or month. Knowing the ingredients you need for each meal helps focus your spending so you aren’t overbuying or relying on last-minute dinner decisions. Those last-minute decisions too often result in take-out! Make your list and stick to it. And if you have a baby at home, making your own baby food is an easy way to save money. You can cook and mash foods yourself and even freeze portions. There are lots of ways to save on clothing costs. Of course there are sales, but there are so many other ways to save. Savings can be found using rebate or coupon apps, shopping at thrift or resale stores, or even participating in clothing swaps. You can also simplify by using a capsule wardrobe or investing in a few quality staple items that will last longer. Of course, with little kids around, their clothing fund is a great place to start reaping savings. Thrift stores, yard sales, and hand-me-downs are great ways to save money. If you live in the city, you can probably get to a lot of places on foot, bike or bus. Not only does that cut down on wear and tear on your car, but also saves money on gas. You might even find you can get by with one car, or none and do a car share program. Another quick win would be shopping around and finding less expensive car insurance. When was the last time you checked out (pun intended) your local library? You just might be surprised at the resources offered. For instance, besides physical books, I can go online and check out e-books and digital versions of magazines, audiobooks, and stream movies on Hoopla and Kanopy. While services may vary depending on your library, chances are there are gems you’ve yet to discover. You might be able to access free museum passes or online classes at Lynda.com. And when the kids were little, our favorite thing to do was go to the library each week for storytime and load up on a bunch of new books to read at home. For free! It’s not just clothes that can be reused. You can eliminate buying paper napkins and paper towels by switching to cloth. Cloth napkins needn’t be fancy for everyday use. I’ve often found good sets with just one stained napkin at the thrift store or you can even make your own if you can sew a simple straight stitch. Have old shirts or towels laying around? Those can be neatly cut to replace paper towels. There are other everyday items that can be repurposed. There is no need to buy fancy jars for organizing if you have cleaned up pasta sauce jars or similar. We save money by rarely buying juices and buying only enough milk for breakfast cereal. Otherwise, water is our beverage of choice at home closely followed by homemade water kefir which is primarily, yup, water. This cuts down on grocery costs and on beverage costs if you just order water when you go out to eat. Of course, you will do some shopping. When you do, pause a moment to check for savings via rebate and discount services such as Ebates or Swagbucks. Interested in earning money with Ebates? You can get $10 automatically if you create an Ebates account through this link. You can also save by checking out daily deal sites such as Groupon or Zulily. The deals are constantly changing on these sites. They are worth checking when shopping to see if there is a deal available on the items you were going to get anyway. 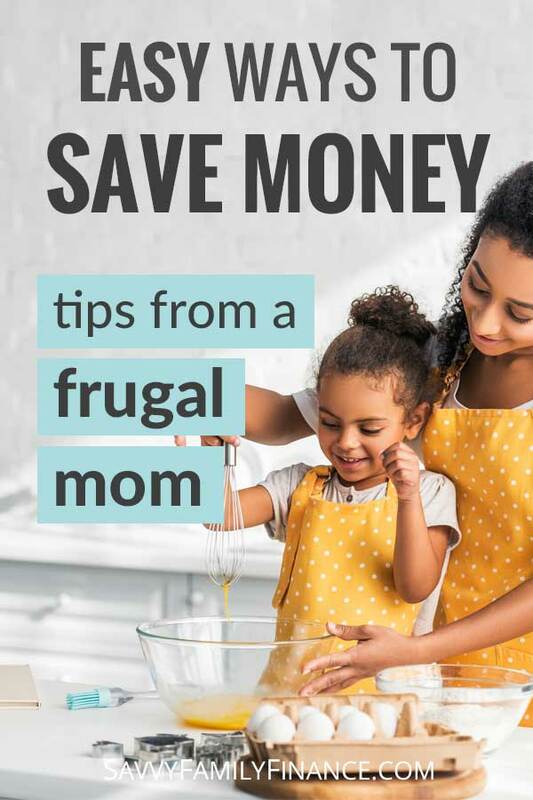 These are just a few ideas from a frugal mom. I’m not perfect, but a bit of thrift here and there certainly helps our family save money. What frugal habits do your family practice?